We have some new blank sample packs on our site and they are causing quite a stir! It has been exciting to put these packs together and see what people are doing with them. Our first addition includes a packet of our most popular blanks. The pack includes a colorful insert that is a key showing all the blanks in their actual size with their model numbers. This feature is especially helpful should you fall in love with any of the blanks in the pack and need their digits! Below are pictures of the insert, the actual blanks, and a design idea that includes every blank in the pack. Obviously you don't have to design one piece with EVERY blank in the pack. We just thought it would be fun to see what our most popular grouping of blanks looked like when stamped and assembled to make this inspirational necklace. Part of the excitement of working with a pack like this one is looking at each blank and figuring out the best project (and recipient) that corresponds with the blank. It's also a great way to try out some new shapes that you may have been eyeing. 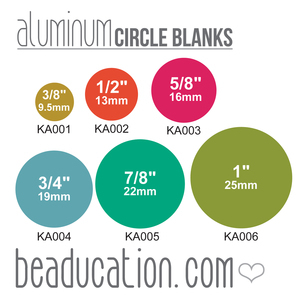 Our second new sample pack includes a variety of sizes of our circle blanks. We think this new product is perfect for beginner and advanced makers alike. It gives you a complete sampling of circle blanks and allows you to see how many letters you can fit on each one. We also love how the key becomes a useful tool to keep handy because you can reference the actual sizes by looking at the true-to-size pictures. The two projects below demonstrate that you can indeed work with EVERY blank in the pack, or split them up and create multiple projects from just one sample pack. The two necklaces above are created from one circle sample pack. 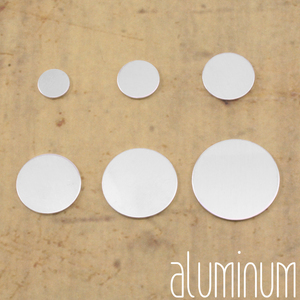 We used our nickel circle sample pack and stamped the names with two different letter sets. The one on the left uses Lowercase Kismet in a larger (3.2mm) size and the right uses Uppercase Kismet in a slightly smaller (2mm) size. 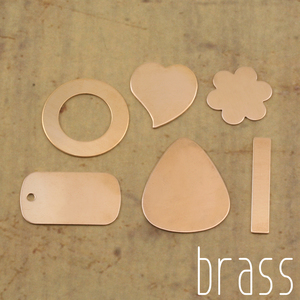 The necklace above uses all the circles that are included in the brass circle sample pack. We used the same names on the corresponding blanks in the two samples above this one as we did for this sample so you can see that the two circles stamped with "Charlotte" are the same size blank, stamped with different font sizes. We want people to see the variety of sizes and fonts that a blank can accommodate. We hope you have as much fun with our sample packs as we do. They take the guess work out of making stacked necklaces and help in deciding upon your favorite size or shape. We hope your jewelry making adventures are exciting and fun, and that these handy packs help out with some of the work. Happy stamping!